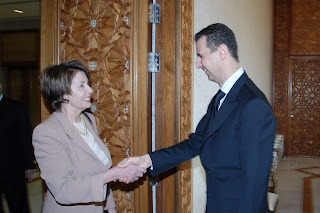 US House Speaker Nancy Pelosi has taken considerable heat for her recent trip to Damascus. While its not a surprise she was attacked on Fox News, this scathing editorial in the Washington Postcuts pretty deep. Meanwhile in Damascus, those attending Pelosi’s reception at the vacant American ambassador’s residence say that while members of the delegation were talking about lifting sanctions on Syria to gain its support for stabilizing Washington’s troubled projects in the region, Pelosi reiterated to those in attendance that on Lebanon and negotiations with Israel, her differences with President Bush were miniscule. Interesting. Two questions: 1- who was talking about lifting sanctions. And 2- who is the source for this, embassy staff?